WOUB Radio and Television are public broadcasting services of Ohio University. Our studios and offices are located in the Radio-TV building on the Athens campus, part of the Telecommunications Center. The Center is a non-academic unit of the College of Communication. Our mission is to to provide a high quality public service to southeastern Ohio and portions of neighboring West Virginia and Kentucky. We also serve as a laboratory for Ohio University students, who are interested in gaining experience in broadcasting and related technologies. In addition to radio and television, WOUB is also active in distance learning, online services, and media production. Free, weekly 59 minute program. 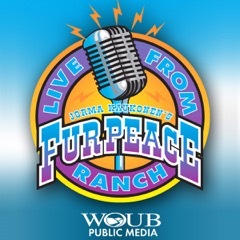 Host Jorma Kaukonen introduces each program's featured artist in a series of concerts recorded at the Fur Peace Ranch guitar camp. An eclectic blend of performances including blues, folk, Americana, rock, bluegrass, and jazz. The second set from Moonalice from their performance recorded September 22, 2018. Dave Revels leads the soul tribute group Shadows of the 60s in the second set from a concert recorded August 11, 2018 at the Fur Peace Ranch. Recorded April 14, 2011, a concert featuring Happy Traum, Larry Campbell, Teresa Williams, and Jorma Kaukonen. The second set from Chris Hillman and Herb Pedersen recorded October 11, 2008 at the Fur Peace Ranch. The second set from Tommy Emmanuel's performance at the Fur Peace Ranch recorded June 25, 2011. Roy Book Binder and Ernie Hawkins recorded in performance at the Fur Peace Ranch from August 9, 2008. From the archives, Chris Hillman and Herb Pedersen, joined by Bill Kirchen, recorded October 11, 2008 at the Fur Peace Ranch. Hot Tuna, with Jorma Kaukonen, Jack Casady, Barry Mitterhoff, and Eric Diaz, joined by G. E. Smith in a performance recorded November 15, 2008. The second set from David Bromberg and Jorma Kaukonen recorded October 25, 2008 at the Fur Peace Ranch. Sets from Kenny Sultan and Roy Book Binder, alone and together, recorded October 4, 2008 at the Fur Peace Ranch.